Anacamptis sancta is a slender and elegant plant, which can grow to a height of 50 cm. The up to 15 unspotted foliage leaves are linear to lanceolate and in the flowering period usually wilted. The erect stem carries up to 30 rather large flowers forming an elongate inflorescence. Petals and sepals form a long, bill-shaped hood with green lines at the exterior. The labellum is three-lobed with the middle lobe longer longer than the broad lateral ones. The bracts are about as long as the ovary, the spur is directed downwards. 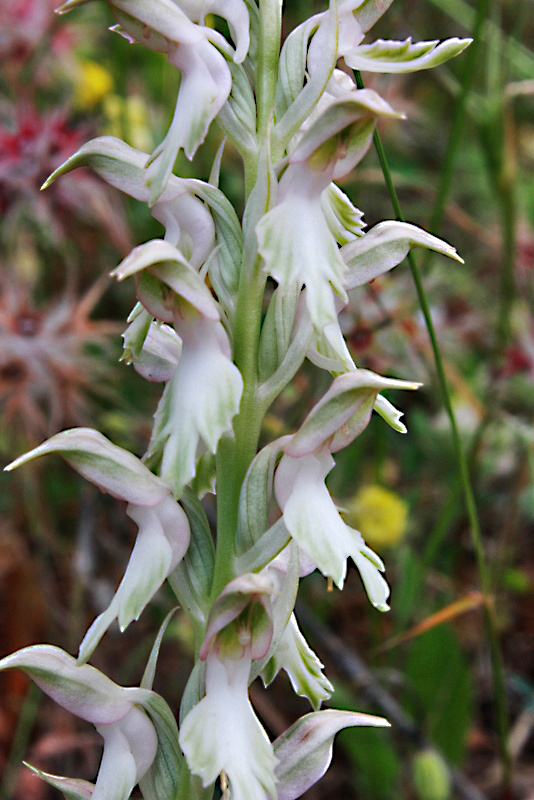 Carl Linné described the plant as Orchis sancta in his opus Systema Naturae (10th edition, volume 2) in 1759. 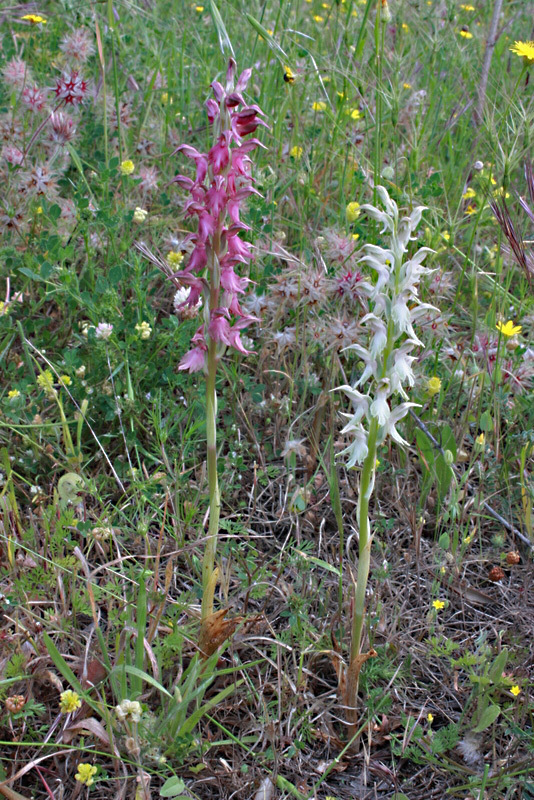 Heinrich Gustav Reichenbach (1824-1889) defined it as Orchis coriophora var. sancta (in Icones Florae Germanicae et Helveticae, 1851). But Orchis sancta was used by most people until Richard Bateman, Alec Pridgeon and Mark Chase put the plant to the genus Anacamptis in 1997. The flowers of Anacamptis sancta are normally pink to dard red. White-flowered plants are quite rare. H. Kretzschmar, W. Eccarius and H. Dietrich (Die Orchideengattungen Anacamptis, Orchis, Neotinea. 2007) are mentioning white-flowered plants, illustrated with a photo taken on Rhodos. Anacamptis sancta grows in arid habitats like maquis and phrygana. Bloom is rather late from April to June. The species is typical for the Eastern Mediterranean and can be found on the Greek islands, Turkey, Cyprus, Israel, Lebanon and Syria.